Go ahead, crank up the volume; when you boost your car's sound system by adding Xplōd™ GT Series speakers, every note will be music to your ears. The woofer cone of this 5.25" speaker is constructed of Sony-exclusive Highly Oriented Polyolefine (HOP) and reinforced with Aramid fibers for extra firmness and smooth mid-range frequencies, while the PEN tweeter delivers crystal clear high frequencies. 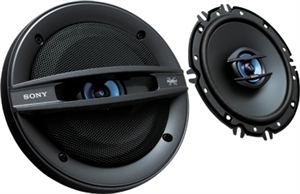 A great upgrade to your existing car audio system, these speakers will take your mobile listening experience to the next level. Crank up your stereo and hear every note with Xplōd™ GT Series speakers. This 6.5" 2-way speaker will make your music come alive. The woofer cones are constructed of Sony exclusive Highly Oriented Polyolefine (HOP) and reinforced with Aramid fibers for extra firmness while the polyethylene naphthalate (PEN) diaphragm tweeters take care of the musical details. Fall in love with your favorite songs all over again when you pump 60 watts of power to your Xplōd™ GT Series 6" x 9" 3-way speakers. Woofer cones constructed of exclusive Highly Oriented Polyolefine (HOP) are reinforced with Aramid fibers for extra firmness and the polyethylene naphthalate (PEN) diaphragm tweeters make it so you won't miss a note. 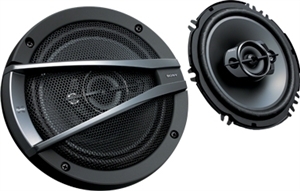 Fill your car with impressive bass and crisp, clear highs with these XS-GTX1642 Sony full range 4-way speakers. Infused with premium components, these speakers offer superb power handling and produce an impressive high to low frequency response to enhance any playlist. Constructed of Aramid fiber and Sony-exclusive Highly Oriented Polyolefine (HOP), the woofer cones deliver greater linearity and smoother response, while the balanced dome polyetherimide (PEI) drivers and PEI tweeters take care of the musical details. Give your sound system the street cred it deserves with these XS-GTX6932 Sony full range 3-way speakers featuring 85W of power and premium components. Constructed of Sony-exclusive Highly Oriented Polyolefine (HOP), the 6" x 9" woofer cone is reinforced with Aramid fibers for extra firmness and smooth mid-range frequencies. Balanced dome polyetherimide (PEI) tweeters deliver crystal clear high frequencies, while the balanced dome MRC mid-range drivers fill out the soundscape with a full spectrum of high to low frequency response for sumptuous, satisfying sound. Your ride to work never sounded better.